LAWRENCE — New study results from the University of Kansas to be presented this weekend at the Gerontological Society of America’s annual meeting in Washington, D.C., bolster the adage that “heart healthy is brain healthy.” The investigation shows neighborhoods that motivate walking can stave off cognitive decline in older adults. “People can walk either to get somewhere or for leisure,” said Amber Watts, assistant professor of clinical psychology, who will share her findings at a symposium Sunday, Nov. 9, in Liberty Salon K at the Washington Marriott Marquis. Watts said neighborhoods that inspire walking for leisure also are full of pleasant things to look at, like walking trails or shade provided by trees. Also, such neighborhoods should make people feel secure on foot. 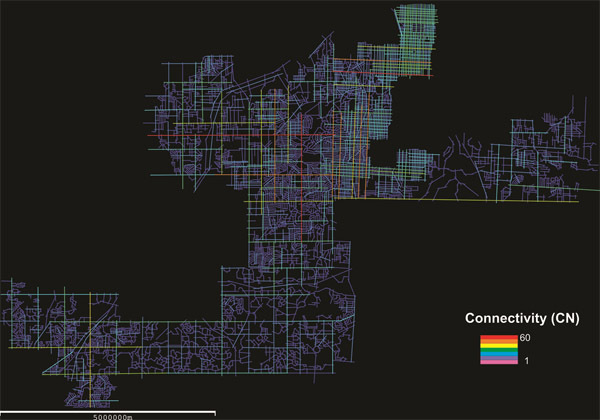 The KU researcher and her colleagues used the space syntax data to estimate a “walkability score” for subjects’ home addresses. Then they estimated the relationship between people’s neighborhood scores and their performance on cognitive tests over two years, factoring in issues like age, gender, education and wealth, that might influence people’s cognitive scores independently of neighborhood characteristics. Interestingly, she found that intricate community layouts might help to keep cognition sharp, rather than serve as a source of confusion in older adults. Watts said that older adults, just like all people, tend to choose the easiest available route or the path of least resistance. “If there is an elevator immediately available, why would we choose the stairs?” she said. Watts said cognitive testing of the research subjects fell into three categories: attention, or mentally rearranging patterns of letters and numbers; verbal memory, or recalling words immediately and after a delay; and mental status, a screening test for symptoms of dementia. The work builds on Watts’ longstanding interest in health behaviors, prevention strategies and bio-behavioral processes associated with cognitive decline and dementia. The research was funded by $20,000 from the National Institute on Aging distributed through the KU Alzheimer’s Disease Center and a KU Strategic Initiative Grant and Frontiers Clinical Translational Science award.